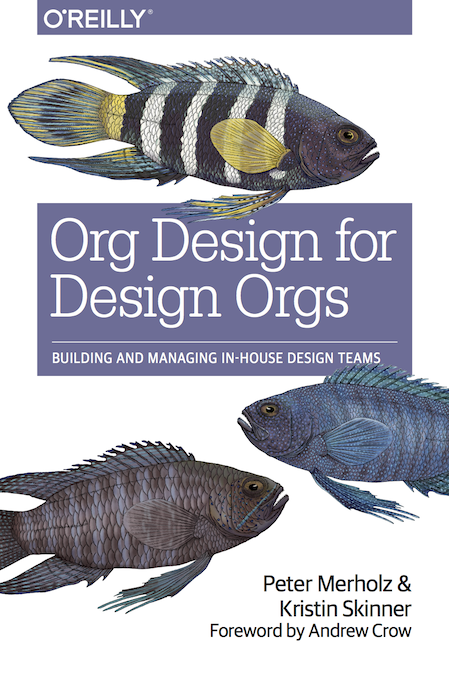 In writing Org Design for Design Orgs, Kristin and I had a sense of the kind of impact it could have, in that it addresses a gap in the current conversation around design, specifically on organizational, operational, and managerial issues. And while we consider this topic vital, we weren’t sure how readers would respond. So, color us thrilled when this unsolicited feedback come our way a couple days ago. Responses like this that affirm our toil was worth it, and suggests the kinds of value you might get from the book. Thank you so much for writing this book! The minute I started reading it, I couldn’t tear my eyes from it. It was almost 2am when I found myself in the middle of chapter 7, and had to really talk myself into getting some sleep that night. Your book is so rich with personable, practical substance on how build design culture, that I felt like I was in a cozy fireside chat with a design mentor. It’s like I was listening to stories from someone who has lived through it all. Someone who could relate and empathize deeply with the issues I’m facing with my design organization now, and give smart, actionable advice on how to proceed forward. I’m a designer and researcher at a startup that grew from 25 to 50 people over the course of 2 years. Our design team suffered through the “drawbacks of centralization” (your description of the “us vs them attitude” and designers rolling their eyes was uncannily accurate), and are now going through the “decentralized and embedded” setup. We haven’t lived in this model long enough to hit the drawbacks, but reading your book felt like it was a warning for what’s to come. Then reading about the “centralized partnership” is where I got seriously excited, and made me itch to propose these changes to my team immediately. Our design team has been through so many ups and downs. Struggling with getting design to be recognized, getting research to be valued and integrated, designers hitting career ruts and stunted growth, issues with aligning with leadership. This book covered all these issues in well organized manner, supported by clear diagrams and real world stories. This truly is the book I wish I had since the beginning. The book I would reference with, write proposals and plans with, wallow in sorrow with, get uplifted with hope with. It confronts the reality of being an in-house designer straight on. I always have it with me when I’m at work, showing highlighted sections to my design manager, to product managers and engineering leads I work with. It’s not only a book that I know will be useful throughout my career in design, it’s the greatest design mentor I could ever ask for, always in my back pocket.